Bikes are small so they’re a lot less intimidating than cars or other vehicles when it comes to repairs. In fact, a lot of simple bike repairs you can do on your own at home with common tools your probably already have. Still, you should know your limits. You don’t want to risk damaging your bike and paying more to in the long run. It’s important to know what you can do on your own versus when it’s time to head to the bike repair shop. Before even looking for a bike repair shop near me, I like to think about a few things and make sure I’ve done everything possible to care for the bike on my own before handing it over to the shop. A mechanic doesn’t want to (and won’t) work on a dirty bike. If you don’t clean it, the bike repair shop will, and they probably won’t be happy about it. They could end up charging you more for wasting their time by dropping off a dirty bike. Before taking your bicycle to the repair shop, do a thorough cleaning on your own. Your mechanic will really appreciate it, trust me. Washing the frame, chain, cassette, and all moving parts with degreaser. Make sure to keep degreaser, lube, and cleaning solutions away from your brakes. Wipe down the chain and moving parts with a soft towel to remove as much dirt and grime as possible. Let your bike dry. Dry the moving parts with a soft towel to make sure they won’t rust as they dry. Apply lube to the chain, cassette, and other moving parts. Most minor maintenance work is really easy to do on your own. I rarely bother looking for somewhere that does bike repair near me for brake adjustments or other minor tune ups. Clean the bike, chain, and moving parts (see above) and reapply lube. Adjust and realign your brakes. After wear and tear they may get sticky or loose. Smooth your gear shifts. Tighten the barrel adjustment on your rear derailleur about one half a turn counter clockwise. While your bike is on the stand, rotate the pedals and attempt to switch gear. If it doesn’t switch to the next cog, rotate another turn. If it skips cogs, you’ve gone too far. Tighten all bolts on the rest of the bike. 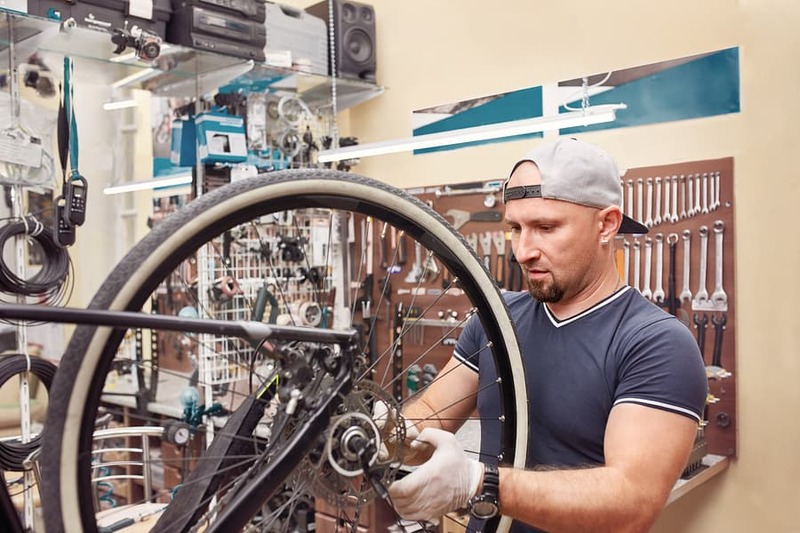 When it comes to bike repair, you’re essentially paying for labor since you probably won’t need new parts. On the other hand, some shops may offer a discount on labor if you’re already buying new parts. Don’t haggle with the mechanic. They’ve set their price and it is pretty insulting to hear someone tell them their time isn’t worth what they’re asking. I have quite a few bike repair shops near me. If I need an important repair, I usually call around and get estimates. Before dropping off your bike for service, make sure to get the estimate in writing to avoid extra charges and confusion when you pick up your bike and pay for the service. The local bicycle repair shop near my house offers walk-in repairs which is nice. In the summer, it can get pretty busy so I recommend making an appointment if possible. No matter how well you care for your bike, you’ll still need to take it in for some repairs every now and then. I like to head to the bike repair shop near me as soon as possible to avoid doing further damage from riding or attempting to do the job myself (I know my limits). They’ll take your entire drivetrain apart (chain, cassette, crankset, derailleurs etc.) and give it a thorough cleaning – possibly even in an ultrasonic cleaner. This isn’t something you want to do on your own without proper training or experience. This is a messy job that requires a lot of tools you probably don’t have. The mechanic will take your entire suspension apart, clean it, and replace it with new parts and new oil. Again, this isn’t an easy job to do on your own. A mechanic will flush your brake fluid and replace the discs if they need to.